The information in this article shared below is general information that is valuable for training kids of all ages; it doesn’t matter if your child is ready to read or not. Don’t try to employ all of these strategies at once, nor should you expect your kid to be able to do everything the first time you try. It is a gradual-process exercise and this information is simply for you to apply at any stage you believe that your child is ready. Please also beware that although the suggestions in this article are called “steps”, they don’t necessarily need to be applied in sequential order, nor are they ordered based on level of importance. This article is simply a guide to help you see how each of the components of reading fit together! The process of teaching your child to read is a process that should begin at infancy. (However, this does not necessarily mean you should subscribe to those programs that claim to teach your baby how to read using flashcards!) What I am advising here is for you to begin reading with your newborn within days of birth! Not only is this a special way of bonding, it helps instill a love for books at such very early stage. That a child naturally enjoys reading at very early stage is one of the predictors of reading success in school-age children. If a child does not enjoy reading it will definitely hamper his/her ability to read sometime down the road when it becomes mandatory. How much you read to your child is variable and should be based on your family preference. But try and target reading minimum 2-3 different books per day, even while your child is still very young. As the baby gets a little older and can withstand longer reading time, make it a family goal to read together aloud for at least 20-minutes each day. And make it fun! Below, I have listed a few suggestions for the kinds of books to read to your kid. But this is not a hard and fast rule. The books should be based on what your child responds to and enjoys most. - Birth-1 Year: Lullabies, Board Books (with real pictures), Cloth Books (with various textures), Song Books. Question asking during “reading-time” with your child is a very great way of encouraging him/her to interact with the book. It also helps to a large extent in developing his/her ability to comprehend what is being read. This is because the main objective of reading to your child is to understand and enjoy; not to just “sound out” words. This is why some children of school-age, even though they can read fluently don’t understand what they are reading and at the end of the day, don’t do well in school. So while you put in all the effort to train your child to read, beware that, if a child can’t comprehend what he is reading, there really is no point to reading at all! While your child is still a baby, endeavor to ask him interactive questions such as, “Do you see the cat?” while pointing at the picture of the cat. This will go a long way in helping to develop his vocabulary. It will also help enhance interactivity with the book that he/she is reading. As she gets older, ask her to point to things in the book by herself. When she does that, make the noises of the animals she sees. This will help to cement the experience in her brain for longer time. As soon as your child is about 2 or 3-years of age, start asking questions before, during, and after reading the book. Show your child the back cover of the book and ask him/her to predict what he/she thinks the book is going to be about. This helps sharpen imagination. Next, teach inference - While reading, ask him what he thinks is will happen or why he thinks a character decided to make a particular choice. If a character is depicting a strong emotion like happiness or excitement, make out that emotion and inquire from your child if he/she has ever felt that way. It helps in building connection with the book at an emotional level. At the end of the book, ask if his prediction(s) came true. Afterwards, ask him/her to summarize the book. This you do by telling him to tell you what he/she remembered happening in the book. Even if your child is captivated and excited about books from an early age, her fascination will gradually dwindle if she does not see reading modeled in her home. However, you don’t necessarily need to be an avid reader; you only need to make a conscious effort to let your children see you reading for at least a few minutes each day! Read a magazine, a cookbook, a novel, your Bible… whatever you choose is up to you! But demonstrate to your child that reading is something that even adults do for fun. If you have a son, try and share this article with your husband. Sons when they see their fathers read, they are more encouraged to do so, especially if their father is like a role model to them. Don’t ever forget, children learn most by example! So, grab a book and take a load off…for your child’s sake, of course! 4. Identify letters in natural settings. 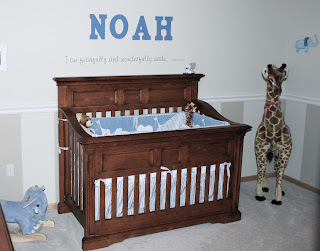 When your child is born, you could paint and hang large wooden letters spelling his/her name above the crib as a decoration in the room. You can never imagine what learning incentive this would be on your child as he/she grows up and begins to identify things. Before long he will start asking what the letters in his name are. That’s honestly the fastest and pressure-free way your child could learn to spell his name. In technical terms, this is called “environmental print” and includes all of the print we are surrounded by–fast food signs, labels, traffic signs, clothing, magazines, etc. Often times, we want to practically coerce our children to learn letter names (alphabets) by a certain age. Some folks buy flashcards or DVDs which claim to have the best way to teach our children their letters. We pressure our 2-year old over and over for minutes on end. And sometimes become even frustrated. Don’t buy into this…give your kid a chance to be a kid and only take advantage of the “teachable moments” as they come along! Children’s’ minds are like sponges. They are without doubt capable of cramming the alphabet from drilling. This may be effective in the short-term but is incapable of producing the effective long term results that you and your family desire. The best way is for you to give your child a chance to be curious about the print he sees around him. Naturally he will start asking questions. That’s your chance to jump in with a practical application that actually has real meaning and significance to your child. Don’t misunderstand the advice offered above and think that learning the alphabet the traditional way is not important. It is certainly important…but the method in which we teach them is even more important! Always remember that your most crucial goal is to foster a lifelong learner who enjoys reading, not a child who has simply memorized without any significance. Children and even adults learn best when multiple senses are involved in the learning process (i.e. multiple domains of development). That’s why practical learning produces longer retention and impression on the child’s mind thus more meaningful application. Therefore, it is vital for you to be attentive to when your child begin showing interest in letters. At this stage, you must in addition to utilizing natural settings for identifying those letters, begin implementing activities that incorporate as many senses as possible. You must be aware that for a child, learning the sound of letters is even more important than learning letter names. There are several ways to integrate multiple domains of development (i.e., involving several senses during the learning process) in regards to letter recognition and early-reading skills. 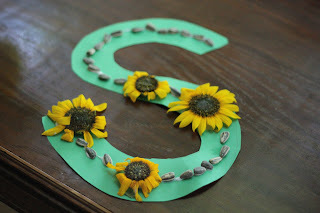 Crafting alphabets (like the picture shown below) allow your child to learn the shape of a letter along with an association of the sound it makes. Also it is important for him/her to do the crafting of the letters; this involves the cutting, gluing, and creating. This incorporates the fine motor skills! Also, playing games that involve gross motor skills (like tossing stuffs on the appropriate letter) are also wonderful ways to include movement. Of course, every child loves songs and rhymes! Take an inventory of your child’s strengths and areas of interest and target activities to fit them!